Atelier Vens Vanbelle has added an extension to a home in Ghent, Beligum that is fit for Jules Verne. 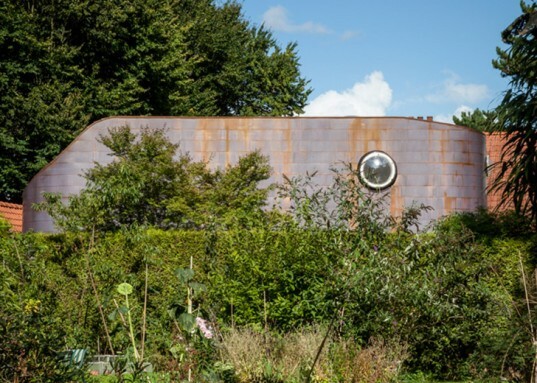 Clad in copper, the sleek curvilinear extension is dotted with submarine portholes for windows. The science-fiction extension adds a new bedroom, bathroom and foyer to the Belgian family’s home. The growing family needed extra space that wouldn’t disrupt their daily habits and flow throughout the farmhouse, which already had a curved glass wall from a previous extension. The architects placed the curved addition adjoining the glass wall, playing up a maritime feel with its shape and the presence of portholes. The copper-clad addition appears like a futuristic capsule that abuts the existing traditional home. Suspended on the second floor, the new volume adds shade to the ground floor, creating an enclosed patio rather than disrupting the flow from the front to back yards. Inside, the new bedroom is met with a floor-to-ceiling glass wall that opens onto an outdoor terrace, lined by the curvature of a copper wall. Adjacent to the bedroom is a stark, white bathroom, day lit by an oculus skylight. The bright white of the bathroom is meant to emulate a cockpit, furthering the addition’s feeling of being a vessel. Although contrasting, the home’s copper addition has its own personality, creating an interesting dialogue between old and new that somehow harmonizes to make a modern home. The growing family needed extra space that wouldn’t disrupt their daily habits and flow throughout the farm house, which already had a curved glass wall from a previous extension. Adjoining the glass wall, the architects added the curved addition, playing up a maritime feel with its shape and the presence of portholes. 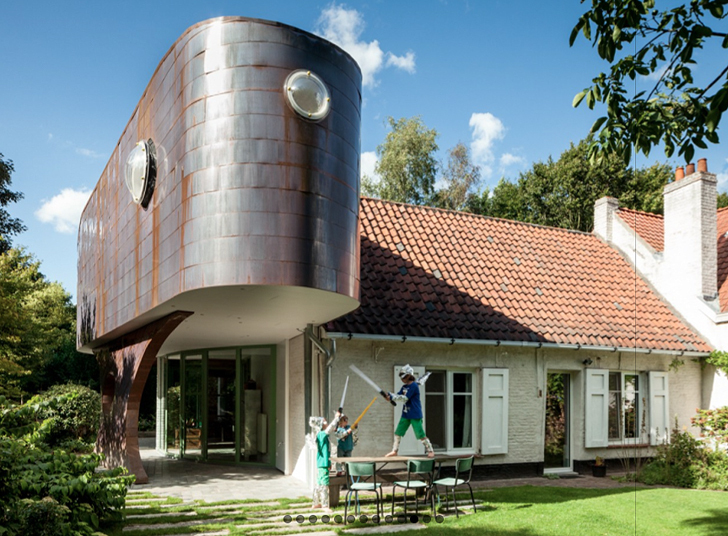 The copper-clad addition appears like a futuristic capsule that adjoins to the existing traditional home. Suspended on the second floor, the new volume adds shade to the ground floor, creating an enclose patio rather than disrupting the flow from the front to back yards. Inside, the new bedroom is met with a floor-to-ceiling glass wall that opens onto an outdoor terrace, lined by the curvature of a copper wall. Adjacent to the bedroom is a stark-white bathroom, day lit by an oculus sky light. The bright white of the bathroom is meant to emulate a cockpit, furthering the addition’s feeling of being a vessel.